Outfit details: scarf - hand-me-down (or, rather, I claimed it as my own) from mum; blouse - church op-shop; vest - Valley Girl; trousers - Target; shoes - a shoe store somewhere near Melbourne. This is what I like to 'do' to my hair when I can't be bothered doing anything - hide almost all of it under a head scarf and add some faux bangs to the mix (which I used to do to the side, without a rat). It still looks vintage (a little bit of land girl chic, perhaps) and is dead easy to do for lazy ladies like myself. These are actually the only full length pants I own - I'm not terribly keen on trousers on myself but there are just some days that I can't be bothered putting on stockings, etc. so wearing a dress seems like a chore. Plus, they're good for my dance lessons! (For anyone who's interested, I started Lindy Hop the other night and was absolutely terrified but had fun, anyway). Oh, also, one of my LiveJournal friends has started a fashion blog - à l'allure garçonnière. I'm really excited about it; if you want to find out what it's all going to be about read her post entitled 'why we need feminist fashion blogs' because I don't want to try to explain myself. Of course you need Snow White on DVD :) I havent seen that movie in too long! Its the first time ive seen you in pants, they look fine, better than on me. I much profer dress or skirt too, thats why i cant wait until the warm weather! What is wrong with Adelaide!? Hrmm I watch So You Think You Can Dance, i think they did Lindy Hop on there once, although I cant really remember what its like. Thanks for the comment. 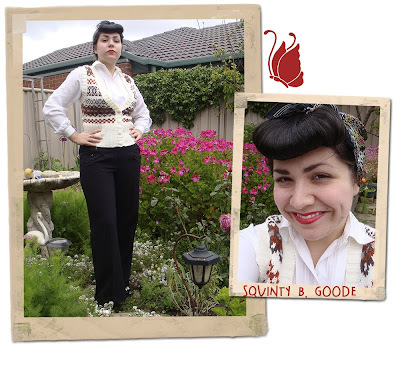 I love that waistcoat! Trousers suit you. you look lovely! i need to get Snow White too :D I love Disney! Movely outfit... when i see you i regret that pants are awful on me ! i hate trousers, too (wearing them, not the look of them) but those are so splendid! they look great on you. once, a few of my friends saw a picture of me in pants and didn't recognize me! i thought that was too funny. You look adorable, as always. Love love love that vest! Thanks for reminding me! I need to go get a copy of that as well! Such a cute DVD shopping outfit!! i love love love this outfit. and i love lazy day hair. i did one of those myself today hehe. Betty Lou: Thank-you. =] Disney is the best! Marie M: Thank-you. =D Aw, I'm sure they're not awful on you at all. Q's Daydream: Thanks. =D Oh, playing with your hair is so much fun - it's almost the most satisfying part of putting an outfit together. Julia: Thank-you. =] Haha, that is funny. Gabriella: Thank-you. =D I love my vest! Ms. B: You're welcome. ;] Thanks. Screen Siren: Thanks, doll. =D Lazy hair days are definitely great. Your hair are gorgeous. Do you use some kind of tool or the bangs are just wrapped on themselves? Ohhhhh, I absolutely adore your hair like that! I would never have thought it was your "can't be bothered to do anything else" style, it's really fantastic! oh you look so pretty in trousers ! why not wear them more often ?